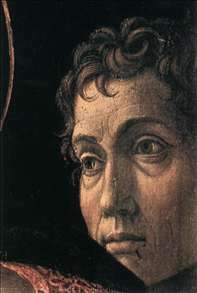 Mantegna, Andrea (1431-1506), one of the foremost north Italian painters of the 15th century. A master of perspective and foreshortening, he made important contributions to the compositional techniques of Renaissance painting. 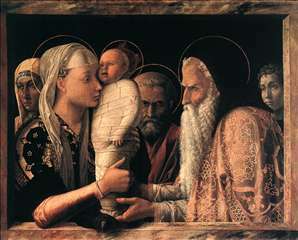 Born (probably at Isola di Carturo, between Vicenza and Padua) in 1431, Mantegna became the apprentice and adopted son of the painter Francesco Squarcione of Padua. He developed a passionate interest in classical antiquity. The influence of both ancient Roman sculpture and the contemporary sculptor Donatello are clearly evident in Mantegna s rendering of the human figure. His human forms were distinguished for their solidity, expressiveness, and anatomical correctness. 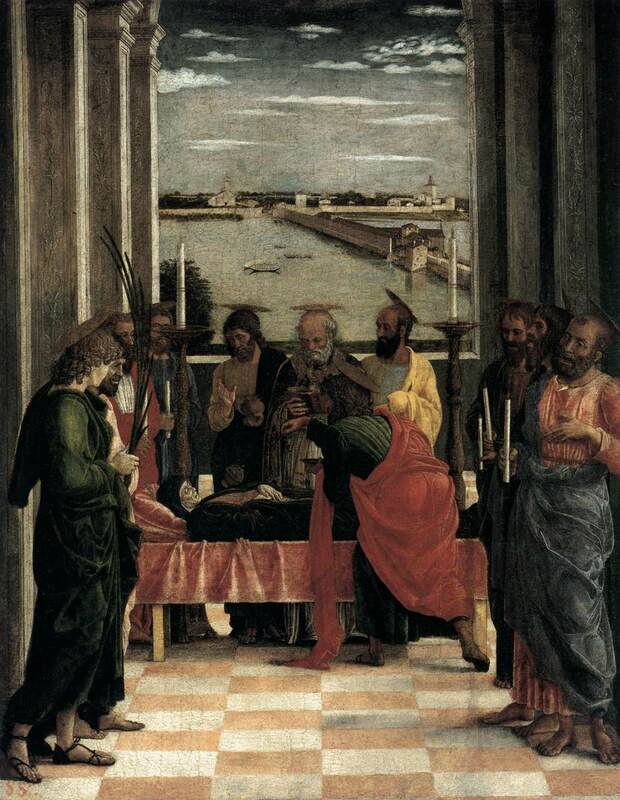 Mantegna s principal works in Padua were religious. 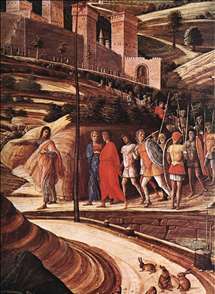 His first great success was a series of frescoes on the lives of St. James and St. Christopher in the Ovetari Chapel of the Church of the Eremitani (1456; badly damaged in World War II). 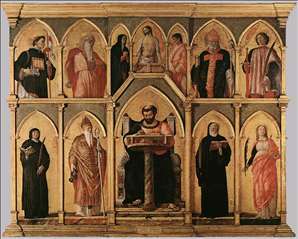 In 1459 Mantegna went to Mantua to become court painter to the ruling Gonzaga family and accordingly turned from religious to secular and allegorical subjects. His masterpiece was a series of frescoes (1465-74) for the Camera degli Sposi (bridal chamber) of the Palazzo Ducale. In these works, he carried the art of illusionistic perspective to new limits. His figures depicting the court were not simply applied to the wall like flat portraits but appeared to be taking part in realistic scenes, as if the walls had disappeared. The illusion is carried over onto the ceiling, which appears to be open to the sky, with servants, a peacock, and cherubs leaning over a railing. This was the prototype of illusionistic ceiling painting and was to become an important element of baroque and rococo art. 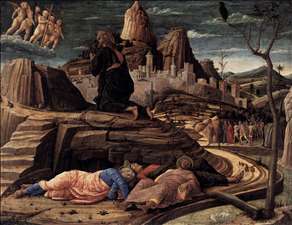 Mantegna s later works varied in quality. His largest undertaking, a fresco series on the Triumphs of Caesar (1489, Hampton Court Palace, England), displays a rather dry classicism, but Parnassus (1497, Louvre, Paris), an allegorical painting commissioned by Isabelle d Este, is his freshest, most animated work. His work never ceased to be innovative. In Madonna of Victory (1495, Louvre), he introduced a new compositional arrangement, based on diagonals, which was later to be exploited by Correggio, while his Dead Christ (Pinacoteca di Brera, Milan) was a tour de force of foreshortening that pointed ahead to the style of 16th-century Mannerism. 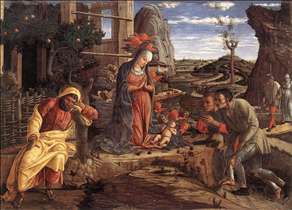 One of the key artistic figures of the second half of the 15th century, Mantegna was the dominant influence on north Italian painting for 50 years. It was also through him that German artists, notably Albrecht Drer, were made aware of the artistic discoveries of the Italian Renaissance. 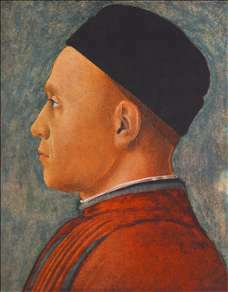 He died in Mantua on September 13, 1506. See more details about "Agony in the Garden"
See more details about "San Luca Altarpiece"
See more details about "San Luca Altarpiece "
See more details about "Agony in the Garden "
See more details about "Death of the Virgin"
See more details about "Presentation at the Temple"
See more details about "Presentation at the Temple "
See more details about "St George"